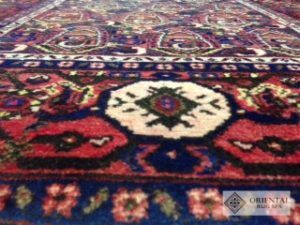 Oriental Rug Spa offer a specialist Persian, Oriental and Contemporary rug cleaning in Weybridge. We also offer a rug repair service. If you own a dirty or soiled rug that needs professional cleaning, then why not give us a call on 01276 423150. You can drop the rug into our wash facility or arrange a time for us to collect from you. Hamadan rugs are woven in the north west of Iran (Persia). They are known as single wefted rugs. This means they have one weft between each row of knots, as opposed to most other rugs which can have multiple wefts. They are very easy to distinguish due to the speckled appearance of the knots on the back. There are man different field designs produced by hundreds of small villages throughout the region. Each village produces approximately three designs typical for eas hdwelling. 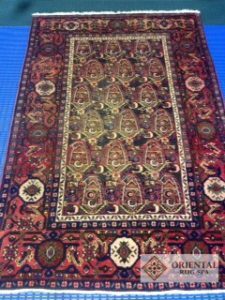 Some experts can tell which village a rug was woven due to the design. Many Hamadan rugs can have fairly loud gaudy colours which are not very subtle. Sometimes these dyes are not very colourfast which can cause issues during the washing process.